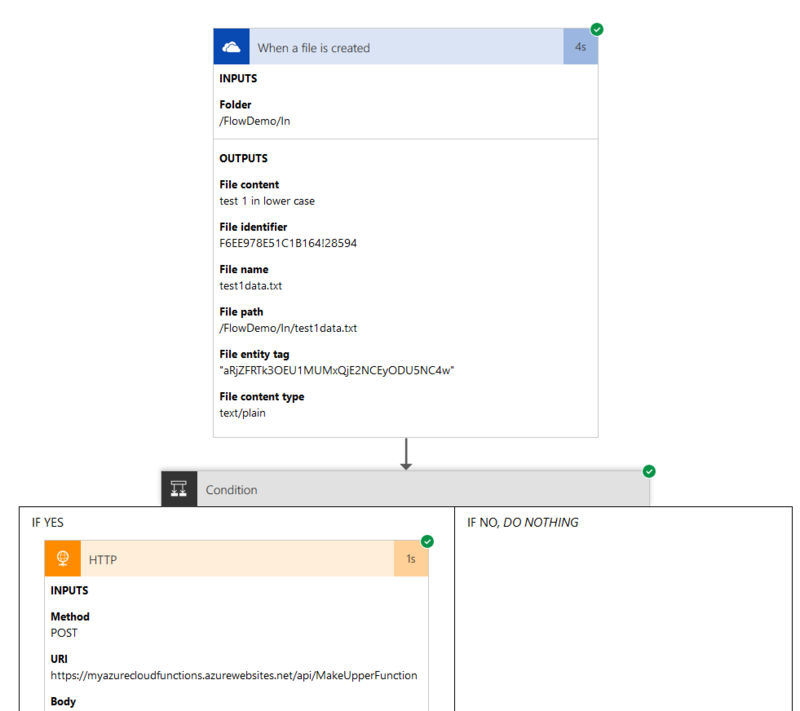 In part 1 we created a Flow to toggle the sending of push notifications on and off by storing the configuration in Azure blob storage. 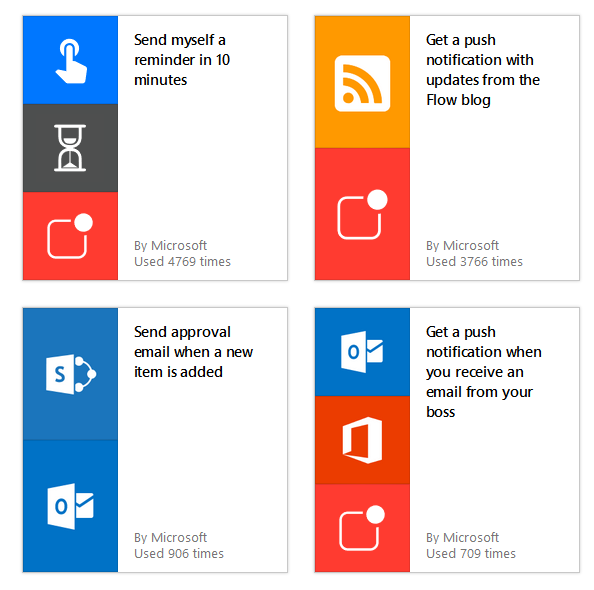 Now that we have a way of enabling/disabling notifications we can start to build the second Flow. Before jumping into the Flow designer, we need to consider how to generate random positivity phrases and how to integrate this into the second Flow. 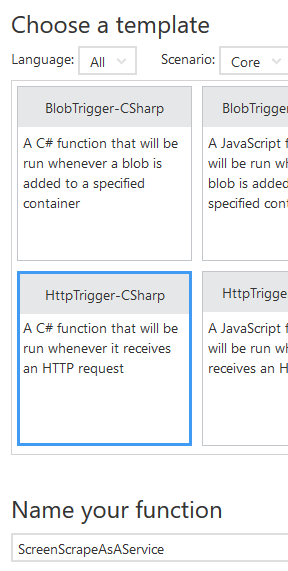 One option to do this is to create a simple Azure Function with an HTTP trigger. The Flow can then use an HTTP action to issue a GET to the server that will return the string content to be sent via push notifications. Notice in the preceding screenshot the authorization level has bee set to “function”. This means the key needs to be provided when the function is called. "Change what you can, don't worry about what you can't"
In the final part of this series we’ll go and create the second Flow that uses this function and the configuration value created in the previous article to actually send random positivity push notifications on a 15 minute schedule. Marten is a .NET document database library that uses an underlying PostgreSQL database to store objects as JSON. The library has a variety of features that allow the logging of SQL statements issued to the underlying PostgreSQL including previewing LINQ query SQL statements. One of the other logging features available allows custom logging to be created for individual session operations such as successfully issued database SQL commands, failed commands, and changes that were saved. There are also numerous other logging/extension points that can be utilized such as logging schema change SQL and automatically using a logger for all sessions. To learn more about the document database features of Marten check out my Pluralsight courses: Getting Started with .NET Document Databases Using Marten and Working with Data and Schemas in Marten or the documentation. Marten is a .NET document database library that uses an underlying PostgreSQL database to store objects as JSON. The library has a variety of features that allow the logging of SQL statements issued to the underlying PostgreSQL database in addition to being able to do things such as get the PostgreSQL query plan for a given LINQ query. 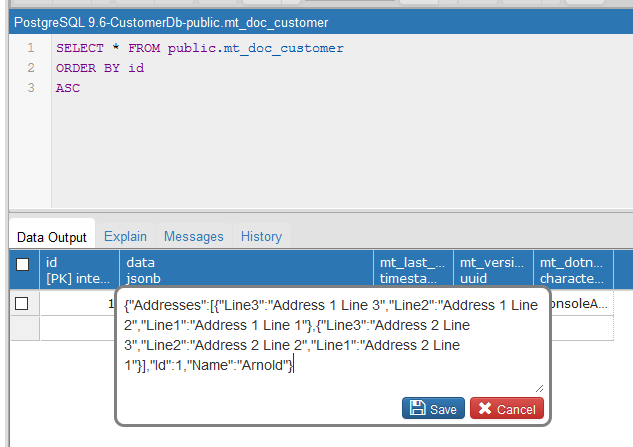 One simple way to get the generated SQL for a Marten LINQ query is to use the ToCommand() extension method. To learn more about the document database features of Marten check out my Pluralsight courses: Getting Started with .NET Document Databases Using Marten and Working with Data and Schemas in Marten. Marten is a .NET document database library that uses an underlying PostgreSQL database to store objects as JSON. Ordinarily, Marten takes care of retrieving the JSON from the database and deserializing it into an object. We can however instruct Marten to perform a query to retrieve document(s) and not perform the deserialization, instead giving us the JSON as it appears in the underlying PostgreSQL record. If we are exposing documents via a Web API, this feature can be taken advantage of to reduce some processing overhead on the server. The preceding method however incurs the additional overhead of Marten deserializing the database JSON into Customer objects, only to be serializing it again back into JSON on the way out of the API. When creating the LINQ query, the Marten ToJsonArray() method can be added to instruct Marten to simply return the JSON directly from the database. Marten is a .NET document database library to allows objects to be stored, retrieved, and queried as documents stored as JSON in an underlying PostgreSQL database. This new course is a follow-on from the previous Getting Started with .NET Document Databases Using Marten course, if you’re new to Marten I’d recommend checking out the previous course first before continuing with this new one. Among other topics, this new course covers how to log/diagnose the SQL that is being issued to PostgreSQL; how to enable offline optimistic concurrency; bulk document inserts; a number of ways to improve query performance; and the customization of database schema objects. You can check out the new course on the Pluralsight site. If you have some data in a web page but there is no API to get the same data, it’s possible to use (the often brittle and error prone) technique of screen scraping to read the values out of the HTML. 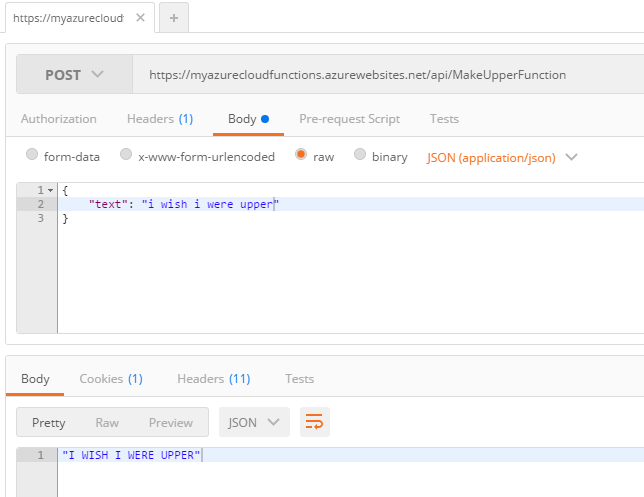 By leveraging Azure Functions, it’s trivial (depending on how horrendous the HTML is) to create a HTTP Azure Function that loads a web page, parses the HTML, and returns the data as JSON. Now we can download the required HTML page as a string, in the example below the archive page from Don’t Code Tired, use some LINQ to get the post titles, and return this as the HTTP response. Correctly selecting/parsing the required data from the HTML page is likely to be the most time-consuming part of the function creation. The full function source code is as follows. 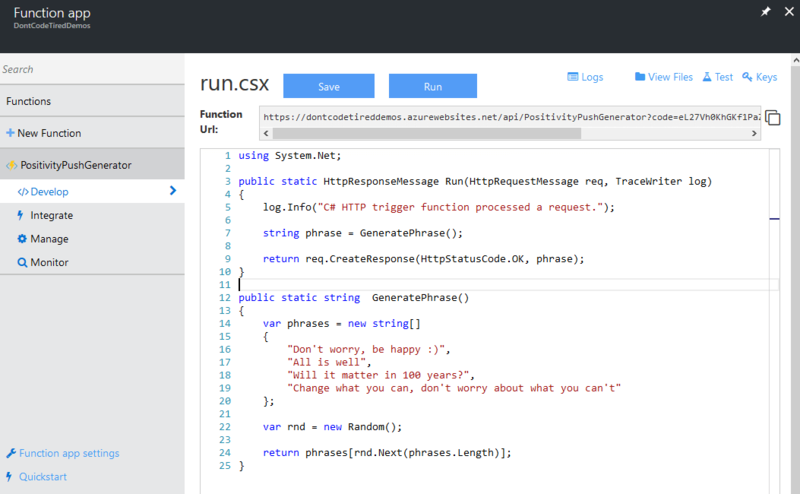 Notice that there’s no error checking code to simplify the demo code. Screen scraping should usually be a last resort because of its very nature it can often break if the UI changes or unexpected data exists in the HTML. It also requires the whole page of HTML be downloaded which may raise performance concerns. In the previous article (Enforcing Referential Integrity Between Documents with Marten and PostgreSQL) we saw how we can enable referential integrity between documents and the example showed a Customer document may have many related Order documents. When creating LINQ queries with Marten, one feature is the idea of included documents. So for example we might want to get a Customer document and all the Order documents for that customer. The .Include() extension method of Marten allows a single round trip to be made to the database that executes a SQL join and returns both the Customer data and Orders. The following code shows how to accomplish this, notice that we need to declare an “output” variable to hold the “included” customer. Even though Marten is a library to enable document database storage semantics, because it’s built on top of (the advanced JSON features) of PostgreSQL, and PostgreSQL itself is relational, we can add constraints between document instances just as we would do in relational normalised databases. The preceding code will result in an order document being stored with an invalid CustomerId. Now running the code again will result in an exception: insert or update on table "mt_doc_order" violates foreign key constraint "mt_doc_order_customer_id_fkey”. 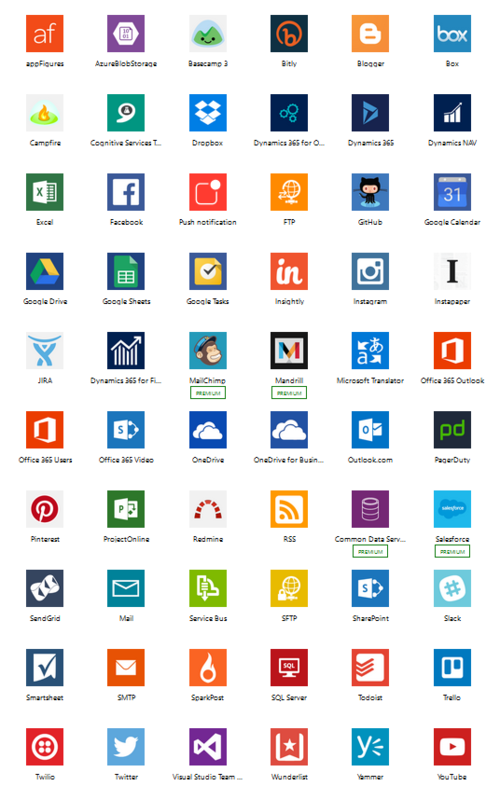 Flow has a number of services including common ones such as Dropbox, OneDrive, Twitter, and Facebook. 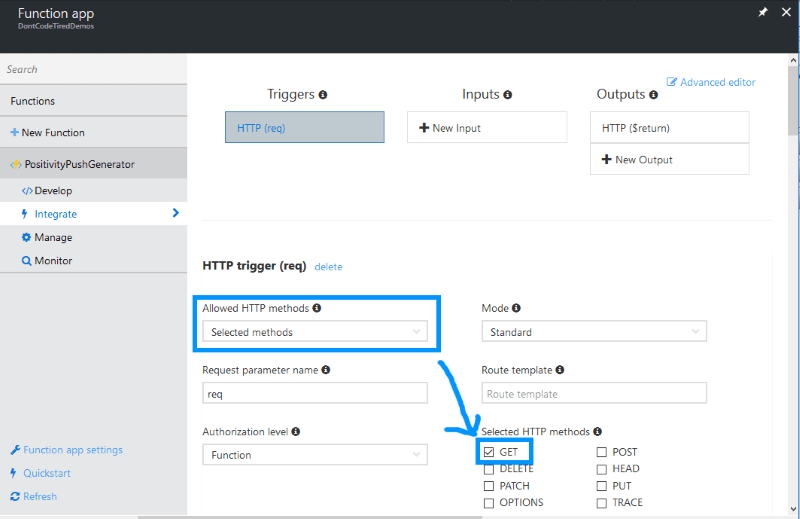 There are also generic services for calling HTTP services, including those created as Azure Functions. Essentially, services are the building blocks of a Flow. Once the free sign up is complete you can create Flows from existing templates or create your own from scratch. To create a new custom Flow, the web-based workflow designer can be used. 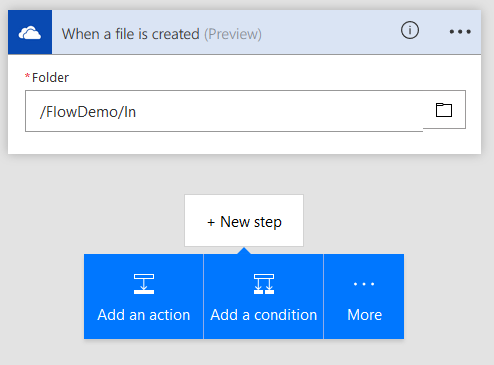 In the following example, a Flow will be created that picks up files with a specific naming convention from a OneDrive folder, sends the text content to an Azure Function that simply converts to uppercase and returns the result to the Flow. The Flow then writes out the uppercase version to another OneDrive folder. 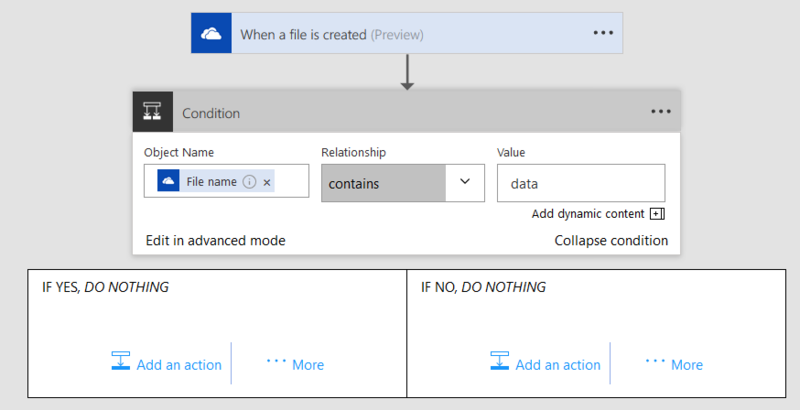 The first step in the Flow is to monitor a specific OneDrive folder for new files. Now if the filename is correct we can go ahead and call an Azure Function (or other HTTP endpoint). 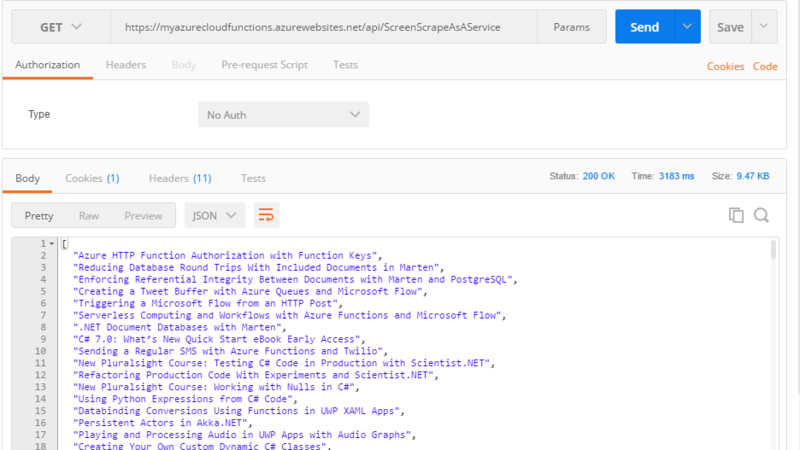 Now that we are reading specific files, we want to call an Azure Function to convert the text content of the file to upper case. 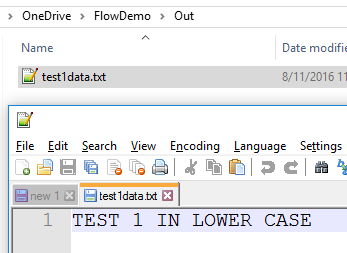 Now we can create a file “OneDrive\FlowDemo\In\test1data.txt”, the Flow will be trigged, and the output file “OneDrive\FlowDemo\Out\test1data.txt” created. 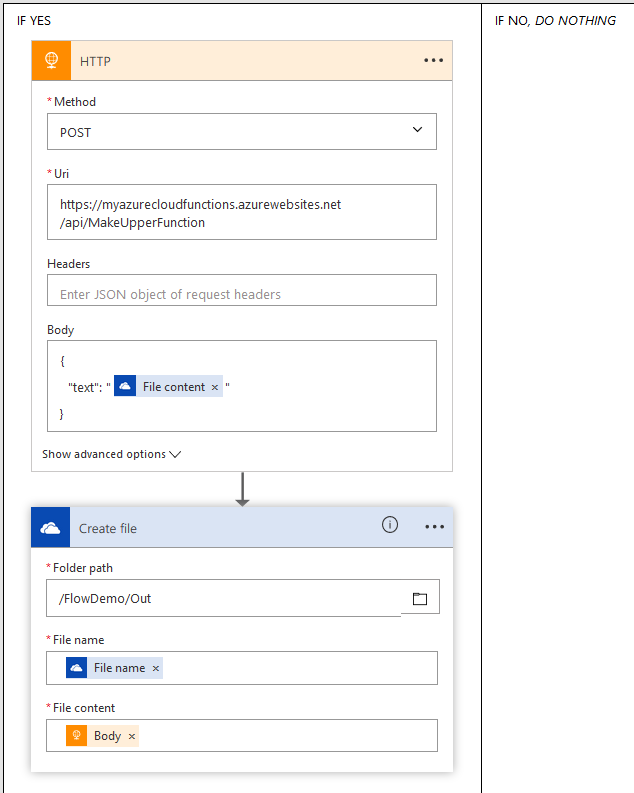 Microsoft Flow by itself enables a whole host of workflow scenarios, and combined with all the power of Azure Functions (and other Azure features) could enable some really interesting uses. Document databases are a form of NoSQL database that store items (objects) as single documents rather than potentially splitting the data among multiple relational database tables. Marten is a .NET library that enables the storing, loading, deleting, and querying of documents. Objects in the application can be stored into the document database and retrieved back as an object from the database. In this approach there is no requirement for the additional “plumbing code” of ORMs. Marten is not a database itself but rather a library that interacts with the (advanced JSON features) of the open source, cross platform PostgreSQL database. Once the Marten NuGet package is installed there are a number of steps to storing .NET objects as documents. Notice in the preceding code that the Address class does not have an Id. This is because the address information will be storing in the overall Customer document, rather than for example in a relational database as rows in a separate Address table. Working with documents happens by way of a session instance, there are a number of types/configurations of sessions available. Once the above code executes, the customer will be stored in a PostgreSQL table called “mt_doc_customer”. The Customer object will be serialized to JSON and stored in a special JSONB field in PostgreSQL. The JSON data also contains all the addresses. "Line1": "Address 1 Line 1"
"Line1": "Address 2 Line 1"